Between your customers, vendors, employees and other moving parts of your organization, it can be difficult to find the time to focus on your business. On a daily basis, you likely have to deal with dozens of tasks, and oftentimes don’t finish them all. So how can you fix this? How can you be more productive, complete your to-do-list and get out of the office on time? There are a couple of key productivity principles and technology solutions that can help. When Bill Gates and Warren Buffet were asked what the single most important reason for their success in life was, both answered with a single word: focus. It is that important. When you work on one task for an extended period of time, the quality of your work is at its highest. What’s more, you’ll also finish that task in a shorter amount of time than if you had to stop and start it repeatedly due to distractions. This principle of focus can be applied to many areas of business and life. Whether you’re writing a report, sharing time with your family, or simply reading a book for your own pleasure, the quality of that experience improves with the more uninterrupted time you dedicate to it. Now, when it comes to IT and technology, this same principle can have a tremendous impact on your business. Not only do technology distractions - such as constantly breaking computers, security breaches, and slow servers - hurt your productivity, but they also crush your spirits. How can you focus on growing your business like this? This is where an MSP comes in. They can help eliminate all IT interruptions so you get back to doing what you do best - running your business. What’s not to love about that? If you ever pulled an all-nighter as a university student, you may be familiar with Parkinson’s law. The principle states that the time it takes to complete a task expands or shrinks depending on the time allotted for it. For example, when you were hitting the books in high school or college, you may have noticed that a few students (and maybe you were one of them) would put off an important paper or project to the last moment and still end up getting an A. While at the same time, other students would take weeks to complete the same project or paper and only manage a B. So how did this happen? This peculiar phenomenon is the magic of Parkinson’s law at work. When you have less time to work on a project, you focus only on the important aspects of it. Oftentimes this is all you need to do a good job. So whether it’s a company meeting or the amount of time you put towards researching your next vacation, apply Parkinson’s law to increase everyone’s focus and ensure you’re not wasting valuable time on the task. As for your IT, give your in-house staff a reasonable, yet specific amount of time, to complete a task. This will ensure they finish the job in a timely manner, and then move on to other projects. 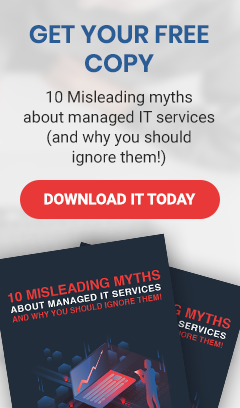 Alternatively, you can simply outsource all of your IT to an MSP for a single, flat monthly fee, and never have to worry about it to begin with. As human beings, technology enables us to become more than we could have ever dreamed of. Apps like Evernote can enable us to remember every valuable piece of information we encounter. Cloud technology can bring a remote workforce scattered around the country together so they can work on the same project simultaneously. VoIP gives you the ability to video-chat with business partners, loved ones, and friends while they’re as far off as Bangkok or Baghdad. Technology is reshaping not only the business world, but also the life of every individual on the planet. So when it comes to your own business, is your company going to take advantage? We hope that these productivity tips will help improve your life in and outside of the office. If you’d like to know more about how IT can transform your business, to make it more efficient and profitable, give us a call today.